At least 55% of human interactions is non-verbal. Are you projecting a confident image and your first impression is the one of a knowledgeable and caring real estate pro? How is your handshake? The first impression is formed in seconds not minutes - make it count. In any environment where you’re meeting people, make sure your right hand is free. Shift anything you’re holding to your left hand well in advance - you don’t want to have to fumble at the last moment. You should definitely avoid holding a drink in your right hand, especially if it’s cold, as the condensation can make your hand feel clammy. Remember - a handshake isn’t just about a single action; there’s a lot more that goes into it. If you’re seated, always rise before shaking someone’s hand. If you’re standing, keep your hands out of your pockets - visible hands make you look more open and honest. Keep your head straight, without tilting it in any way, and face the person fully. Make sure to use plenty of eye contact, and smile warmly, but briefly (too much smiling could make you appear over-eager). When you’re reaching out your hand to shake, keep it perfectly perpendicular, neither dominant (palm down) nor submissive (palm up). When in doubt, angle your thumb straight up to the ceiling. Open wide the space between your thumb and index finger, which will ensure you get optimal thumb-web contact (which makes for the ideal handshake). To ensure the right level of contact between your hand and your partner’s, keep your palm flat - not cupped - when you reach out to shake. Once full contact is made, lock your thumb down and squeeze firmly - you can mirror your partner's handshake if it's firm and assertive. Shake from your elbow (not your wrist) - about 2-3 pumps. You can linger for a moment if you want to convey particular warmth, then release and smile. Sound like a lot? It is, until you get the hang of it. Try practicing with friends or family - people who will give you truly candid feedback. 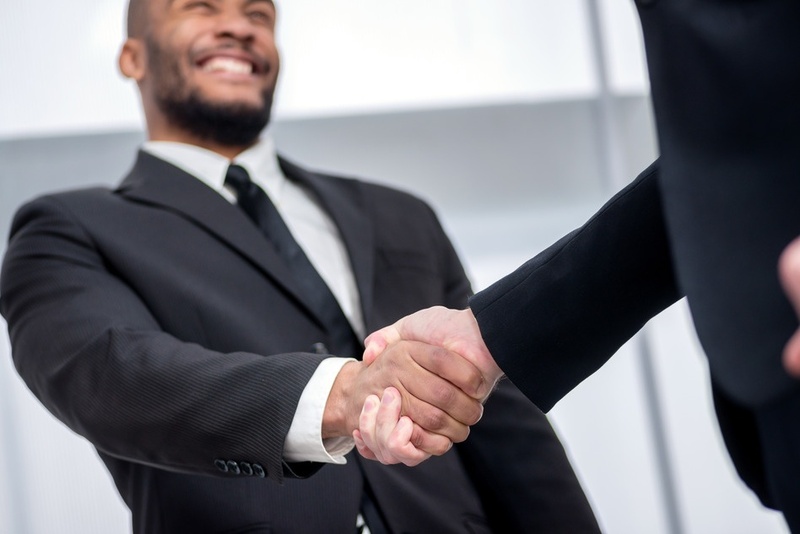 This type of practice is what will truly make your handshake perfect, and make a dramatic difference in how prospective and existing clients and business partners perceive you. Have you mastered an art of a perfect handshake? Share in the comments below. Want to be more confident by getting into your lead mind?